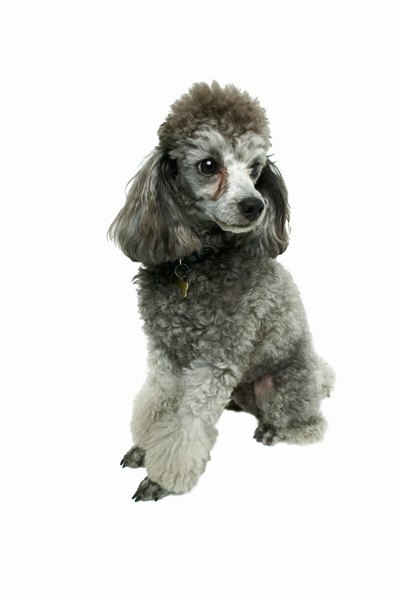 Poodle clips create distinctive furry areas of differing length. Standard poodles were once water-going working dogs. Various hairstyles featuring distinctive “poms” were incorporated to reduce the weight of a wet coat to aid movement while providing insulation to the joints and chest. These “clips” are no longer a practical necessity, but have endured as a style across the entire poodle range. Even your toy poodle can wear a fancy clip, despite never having been a working dog. The muzzle, rump and all legs above the feet are shaved short. The rest of the fur is trimmed, but kept relatively long to create a distinctive “pom” effect. The tail is shaved short, save for a pom at the tip and the base. This is an American Kennel Club-approved clip style used for dog shows. The English saddle clip is very similar to the continental clip. The main difference is the hind legs, which are covered in fur, but that fur is separated into three distinct poms using scissors. The rump, middle section and ankle each have their own pom, with a small shaved section between each to provide definition. The muzzle, front legs above the ankle and middle section of the tail are shaved short. The feet are scissored short too. The English saddle is an approved style for American Kennel Club-sanctioned conformation shows. Dogs that are under 12 months of age should wear the puppy clip if they're entering conformation dog shows. The muzzle, feet and the base of the tail are shaved short, while the rest of the coat is scissored into shape so it looks neat, tidy and complements the form of the poodle. This also is an approved American Kennel Club hairstyle. This informal style isn't recognized for conformation shows. It's a practical style for pets, rather than a demonstration style for show dogs. The base of the tail, feet and face are shaved short, while the rest of the body is scissored to keep it tidy. The unshaven hair can be styled with a comb to make it fluffy, which gives your pet toy poodle an adorable, lamb-like appearance. Practical and comfortable for summer, this style is short all over, with shaved portions on the face, feet and base of the tail. It’s up to you how short you want to scissor the main bulk of the fur, but remember that a shorter coat is easier to maintain and keep clean, especially if you and your toy poodle plan on taking long walks in the countryside.